Atypical dilation or formation of capillaries as a mid- or long-term response to radiation. These are a benign but sometimes impressive-looking tissue change. Often, post-radiation telangiectasias do not appear until a year or more following the end of the course of radiation. Early after conclusion of radiotherapy for a left anterior vocal cord cancer. There is a small amount of resolving radiation mucositis (white patches) in the interarytenoid area. 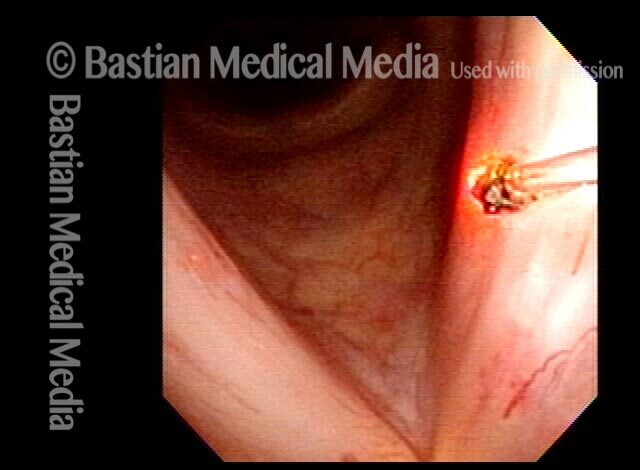 Nearly a year later, with mild vascular prominence, especially left vocal cord (right of image). Now nearly two years after end of radiotherapy, much more prominent vascularity, called post-radiation telangiectasia. This side effect of radiation often begins to happen between one and two years after the end of radiotherapy. Notice that the post-radiation telangiectasias involve all areas that received radiation (including false vocal cords, etc. ), and not just the area of original tumor. Voice remains very good. Just over three years after the radiotherapy, telangiectasia now exuberant, but fairly stable. Voice remains very good. Hoarseness began 2 years prior to this initial examination photo. This middle aged man has never smoked; has no reflux symptoms, nor has he had any response to empiric reflux therapy. Biopsy shows inflammation with moderate dysplasia. HPV testing was negative. No explanation for this chronic inflammation is ever found. A series of KTP laser treatments of stippled vascular areas and leukoplakia ensues. A year later, similar findings except appearance of a slight anterior commissure inflammatory web. 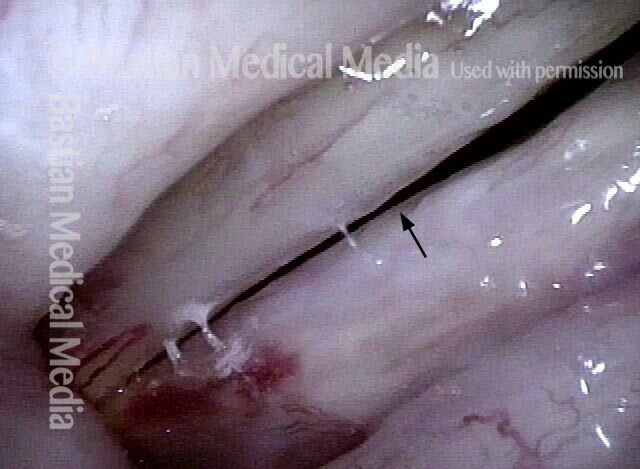 Eventually, after an additional 2 years (5 years after onset of hoarseness) a second biopsy is triggered by aberrant, “corkscrew” capillaries. The diagnosis: squamous cell carcinoma-in situ. Laser excision is typically preferred for well-demarcated early vocal cord cancer, but the diffuse, superficial and bilateral abnormalities suggested radiotherapy instead. Six weeks after the end of his 30 radiation treatments, healing of the superficial ulceration (within dotted lines) is underway. Closer view, now under narrow band light: A fine vascular pattern has returned except in the areas bounded by dotted lines. Six weeks later (3 months after end of radiotherapy), the superficial ulceration has healed, and voice is very functional. Note the regenerated vascular pattern, and compare with photo 4. “On schedule” a year after the end of successful radiation therapy, post-radiation telangiectasias are becoming evident. Compare progression of these telangiectasias in photos 4, 5, 6, 7, and 8. Now 3 years from the end of radiotherapy, radiation telangiectasia are “maximal” and stable. Voice remains very good. Same view, under narrow band light. 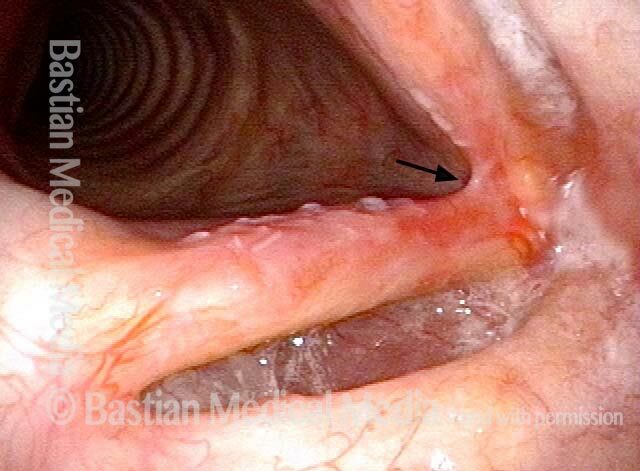 Years after radiotherapy for vocal cord cancer, the exaggerated capillaries are not typical capillary ectasia, but instead post-radiation telangiectasias. The "polyp" may be also radiation-related because there is no history of voice over-use. At the conclusion of pulsed-KTP coagulation of the "polyp." The "polyp" has pulled off with the fiber. Three weeks later, the vocal cords now match, voice is improved, and the site of surgery (arrow) is healed. More than five years after radiotherapy for early vocal cord cancer, the post-radiation telangiectasias seen here are maximal and not expected to increase further. What can occasionally increase, are small polyp-like elevations (arrow to the left). Narrow band light at closer range dramatically accentuates vascularity. Intense red becomes almost black; pink becomes blue-green. This entry was posted in Multimedia Encyclopedia and tagged Disorders, Other benign mucosal lesions, Photos, Voice & other larynx disorders by admin. Bookmark the permalink.